Guests: Dr. Amanda Mortimer and Dr. Beth Weinman. Topic: Are you afraid of science? Do you suffer from Maths Anxiety? And are you transferring some of these fears to your children, even as you are anxious for them to do well in the STEM (Science, Technology, Engineering, and Mathematics) disciplines? In this episode, neuropsychologist Dr. Amanda Mortimer from Fresno State helps us develop a better scientific understanding of how fear and anxiety affect our ability to learn and remember things, and what are good ways to address the anxiety triggered for so many by science and mathematics. Dr. Beth Weinman discusses how some of this developing understanding of learning and memory is being applied to improve the success of incoming Science majors in a new First Year Experience program in Fresno State’s College of Science & Mathematics. The program (in which Dr. Katti is a collaborator) is particularly focused on helping students who are from economically challenging backgrounds, from under-represented minorities, or are the first generation from their families to ever go to college – demographics which constitute the majority of students on our campus and indeed in the Central Valley. A better understanding of how the mind works for optimal learning should help these students break patterns of anxiety about learning science and mathematics which have held them back, and go some way towards addressing the leaky pipeline in developing a new generation of diverse scientists and science-literate citizens. Have a listen, and do share any thoughts you might have about your perception of science and learning. 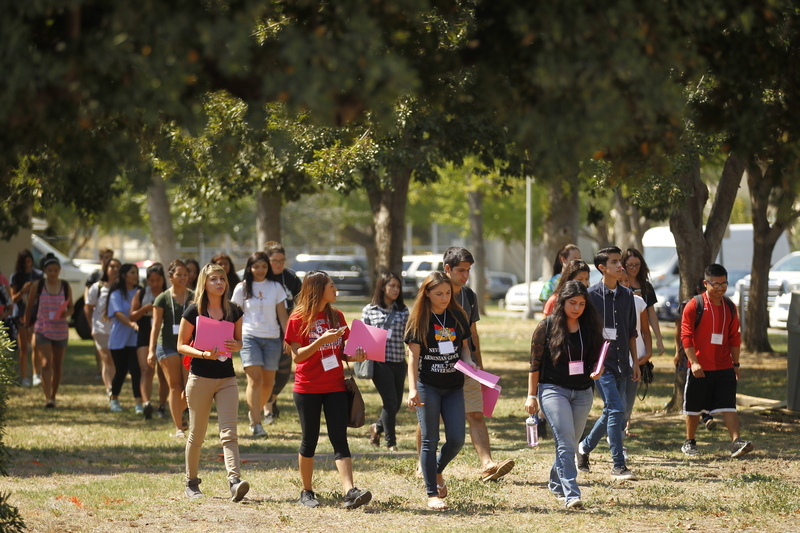 Image: Students from the incoming Freshman class of Science & Maths majors at Fresno State. Photo by Cary Edmondson, the official University Photographer.